What are the different types of commercial vessels? Commercial vessels are as varied as the jobs they are required to do. Let’s start with the major categories, These major categories break down even further into specific categories, as seen below. A tug boat is a vessel designed to push or pull other vessels to another location or maneuver them into position. Barges are vessels that are designed to be loaded either on top or inside of it to carry a product to a location. Most barges are either pushed or pulled by tugs, but some are also self-propelled. Crew boats are designed to carry personnel (crew) to other locations, In many cases crew boats also have large back decks that can accommodate deck cargos. They are the virtual sea-going taxis. Supply boats are designed to carry both large amounts of deck cargo, also having internal tanks for various liquid products to oil field rigs. These are known as the sea-going trucks. Fishing vessels are vessels designed to accomplish various fishing activities. 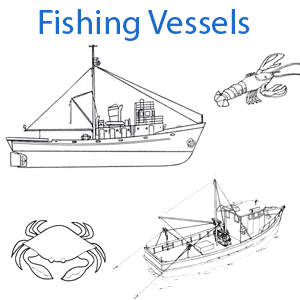 These vessels are widely varied in size and type depending on their intended fishery. Patrol-Security vessels are vessels designed for patrolling the coast in an enforcement of regulations activity, where security vessels are usually used in harbor activities to enforce closures or to keep unwanted vessels a safe distance from a location or a ship. Passenger vessels are used in a wide array of purposes, from small sightseeing vessels to cruise ship. With their primary function being to accommodate passengers. Cargo vessels are ships used in the transporting of various types of cargos all over the world. Today’s article is going to take a look at the Fishing Vessel sub-categories. This is by far is not an all- inclusive list, but gives a bit of insight into the different types of fishing vessels. We will go into more detail of each category in further articles. For this article we are high-lighting long liners. Press on the words “Long Liners” to get in-depth information on that category.